"Eurovision" and "Eurosong" redirect here. For the television exchange which the contest was named after, see Eurovision (network). For Belgium's final song and artist, see Eurosong (Belgium). For Greece's final song and artist from 2013 to 2015, see Eurosong - A MAD Show. For the most recent contest, see Eurovision Song Contest 2018. For the upcoming contest, see Eurovision Song Contest 2019. For other uses, see Eurovision (disambiguation). The Eurovision Song Contest (French: Concours Eurovision de la chanson), often simply called Eurovision, is an international song competition held primarily among the member countries of the European Broadcasting Union. Each participating country submits an original song to be performed on live television and radio, then casts votes for the other countries' songs to determine the winner. At least 50 countries are eligible to compete as of 2018[update], and since 2015, Australia has been allowed as a guest entrant. Winning the Eurovision Song Contest often provides a short-term career boost for artists, but rarely results in long-term success. Exceptions include ABBA (winner in 1974 for Sweden), Bucks Fizz (winner in 1981 for the United Kingdom), and Celine Dion (winner in 1988 for Switzerland), all of whom launched successful careers. Based on the Sanremo Music Festival held in Italy since 1951, Eurovision has been broadcast every year since its inauguration in 1956, making it the longest-running annual international television contest and one of the world's longest-running television programmes. It is also one of the most watched non-sporting events, with audience figures of between 100 million and 600 million internationally. It has been broadcast in several countries that do not compete, such as the United States, Canada, New Zealand, and China. Since 2000, it has been broadcast online via the Eurovision website. Ireland holds the record for most victories, with seven wins, including four times in five years in 1992, 1993, 1994, and 1996. Under the current voting system, in place since 2016, the highest-scoring winner is Salvador Sobral of Portugal who won the 2017 contest in Kiev, Ukraine, with 758 points; under the previous system, the highest-scoring winner was Alexander Rybak of Norway with 387 points in 2009. As a war-torn Europe was rebuilding itself in the 1950s, the European Broadcasting Union (EBU)—based in Switzerland—set up an ad hoc committee to search for ways of bringing together the countries of the EBU around a "light entertainment programme". At a committee meeting held in Monaco in January 1955 with Marcel Bezençon of the Swiss television as chairman, the committee conceived the idea (initially proposed by Sergio Pugliese of the Italian television RAI) of an international song contest where countries would participate in one television programme to be transmitted simultaneously across all countries of the union. The competition was based upon the existing Sanremo Music Festival held in Italy and was seen as a technological experiment in live television. In those days it was a very ambitious project to join many countries together in a wide-area international network. Satellite television did not exist and the Eurovision Network comprised a terrestrial microwave network. The concept, then known as "Eurovision Grand Prix", was approved by the EBU General Assembly in a meeting held in Rome on 19 October 1955, and it was decided that the first contest would take place in spring 1956 in Lugano, Switzerland. The name "Eurovision" was first used in relation to the EBU's network by British journalist George Campey in the London Evening Standard in 1951. The first contest was held in the town of Lugano, Switzerland, on 24 May 1956. Seven countries participated—each submitting two songs, for a total of 14. This was the only contest in which more than one song per country was performed: since 1957, all contests have allowed one entry per country. The 1956 contest was won by the host nation, Switzerland. The contest was first known as the "Eurovision Grand Prix" (in English). This "Grand Prix" name was adopted by Germany, Denmark, Norway and the Francophone countries, with the French designation being Le Grand-Prix Eurovision de la Chanson Européenne. The "Grand Prix" was dropped in 1973 and replaced with Concours (contest) in French and in 2001 with the English name in German, but not in Danish or Norwegian. The Eurovision network is used to carry many news and sports programmes internationally, among other specialised events organised by the EBU. However, in the minds of the public, the name "Eurovision" is most closely associated with the Song Contest. The format of the contest has changed over the years, though the basic tenets have always been thus: participant countries submit original songs, performed live on a television programme broadcast across the Eurovision Network by the EBU simultaneously to all countries. A "country" as a participant is represented by one television broadcaster from that country: typically, but not always, that country's national public broadcasting organisation. The programme is hosted by one of the participant countries, and the programme is broadcast from the auditorium in the host city. During this programme, after all the songs have been performed, the countries then proceed to cast votes for the other countries' songs: nations are not allowed to vote for their own song. At the end of the programme, the song with the most points is declared as the winner. The winner receives, simply, the prestige of having won—although it is usual for a trophy to be awarded to the winning songwriters, and the winning country is formally invited to host the event the following year. The programme is invariably opened by one or more presenters, welcoming viewers to the show. Between the songs and the announcement of the voting, an interval act is performed. These acts can be any form of entertainment. Interval entertainment has included such acts as the Wombles (1974) and the first international performance of Riverdance (1994). As national broadcasters join and leave the Eurovision feed transmitted by the EBU, the EBU/Eurovision network logo ident (not to be confused with the song contest logo) is displayed. The accompanying theme music (used on other Eurovision broadcasts) is the prelude to Marc-Antoine Charpentier's Te Deum. Originally, the same logo was used for both the Eurovision network and the European Broadcasting Union, however, they now have two different logos; when the ident is transmitted, it is the Eurovision network logo that appears. Since 1995 the final of the Contest has taken place on a Saturday evening in May, at 19:00 UTC (15:00 EDT, 20:00 BST/IST, or 21:00 CEST). In the early years, the competition was held variously on Sunday, Tuesday, Wednesday and Thursday evenings; since 1963, every Contest final has taken place on a Saturday. The earliest show in the calendar year took place in 1957 (3 March) and the latest in 1999 and 2010 (29 May). Eligible participants include primarily Active Members (as opposed to Associate Members) of the EBU. Active members are those who are located in states that fall within the European Broadcasting Area, or are member states of the Council of Europe. The western boundary of Region 1 is defined by a line running from the North Pole along meridian 10° West of Greenwich to its intersection with parallel 72° North; thence by great circle arc to the intersection of meridian 50° West and parallel 40° North; thence by great circle arc to the intersection of meridian 20° West and parallel 10° South; thence along meridian 20° West to the South Pole. Active members include media organisations, whose broadcasts are often made available to at least 98% of households in their own country which are equipped to receive such transmissions. If an EBU Active Member wishes to participate they must fulfil conditions as laid down by the rules of the contest. A separate copy is drafted annually. As of 2015[update], this included the necessity to have broadcast the previous year's programme within their country. After Russia's withdrawal from the 2017 event in Ukraine, and Channel 1 Russia's refusal to air the event, there is some confusion as to whether this rule still exists. C1R did enter a song in 2018, which was voted out of the competition at the semi-final. A common misconception is that Eurovision participants have to be from Europe. However, that's not true, any full EBU member is eligible for participation. Furthermore, associate members are eligible for participation since Eurovision 2017, as long as the Eurovision Reference Group approves it (on a case by case basis). As of 2019[update], Australia is the only associate member to have participated. The broadcaster must have paid the EBU a participation fee in advance of the deadline specified in the rules of the contest for the year in which they wish to participate. Eligibility to participate is not determined by geographic inclusion within the continent of Europe, despite the "Euro" in "Eurovision" – nor does it have any relation to the European Union. Several countries geographically outside the boundaries of Europe have competed: Israel, Cyprus and Armenia in Western Asia (Cyprus is a member of the Council of Europe and a member state of the European Union), since 1973, 1981 and 2006 respectively; Australia in the Australian continent, since 2015 and Morocco, in North Africa, in the 1980 competition alone. In addition, several transcontinental countries with only part of their territory in Europe have competed: Turkey, since 1975; Russia, since 1994; Georgia, since 2007; and Azerbaijan, which made its first appearance in the 2008 edition. Cities that have hosted the Eurovision Song Contest. a) Before German reunification in 1990 occasionally presented as West Germany, representing the Federal Republic of Germany. East Germany (the German Democratic Republic) did not compete. b) The entries presented as being from "Yugoslavia" represented the Socialist Federal Republic of Yugoslavia, except for the 1992 entry, which represented the Federal Republic of Yugoslavia. This nation dissolved in 1991/92 into five independent states: Slovenia, Croatia, North Macedonia (as Macedonia/FYROM), Bosnia and Herzegovina and the Federal Republic of Yugoslavia. The Federal Republic of Yugoslavia reconstituted itself as Serbia and Montenegro in 2003—entered the contest in 2004—and finally dissolved in 2006, making two separate states: Serbia and Montenegro; both of which made their début in the contest in 2007, the winner that year being Serbia. c) The participation of Australia was intended as a one-off event to commemorate the 60th anniversary of the Contest unless they won in 2015 in which case they would have been allowed to defend their crown in 2016. However it was revealed in May 2015 that Australia might become a permanent participant following some reports by Jon Ola to the Swedish broadcaster. In November 2015, the EBU announced that Australia would return in 2016 and after this the country will become an effective participant in the contest. Most of the expense of the contest is covered by commercial sponsors and contributions from the other participating nations. The contest is considered to be a unique opportunity for promoting the host country as a tourist destination. In the summer of 2005, Ukraine abolished its normal visa requirement for visitors from the EU to coincide with its hosting of the event. Preparations for the event start a matter of weeks after the host wins in the previous year, and confirms to the EBU that they intend to—and have the capacity to—host the event. A host city is chosen—often a national or regional capital city—and a suitable concert venue is identified. The two largest concert venues were Parken in Copenhagen (which held approximately 38,000 people when Denmark hosted in 2001) and the Esprit Arena in Düsseldorf (which held approximately 36,500 people when Germany hosted in 2011). The smallest town to have been hosts was Millstreet in County Cork, Ireland, in 1993. The village had a population of 1,500—although the Green Glens Arena venue could hold up to 8,000 people. The hotel and press facilities in the vicinity are always a consideration when choosing a host city and venue. In Kiev 2005, hotel rooms were scarce as the contest organisers asked the Ukrainian government to put a block on bookings they did not control themselves through official delegation allocations or tour packages: this led to many people's hotel bookings being cancelled. 1960—hosted by the BBC in London when the Netherlands declined due to expense. The UK was chosen to host because it had come second in 1959. 1963—hosted by the BBC in London when France declined due to expense, as did second- and third-placed Monaco and Luxembourg when offered hosting duties. 1972—hosted by the BBC in Edinburgh when Monaco was unable to provide a suitable venue: Monegasque television invited the BBC to take over due to its previous experience. 1974—hosted by the BBC in Brighton when Luxembourg declined due to expense. The BBC was becoming known as the host by default, if the winning country declined. 1980—hosted by the NOS in The Hague when Israel declined due to expense, having staged the 1979 event in Jerusalem, and the fact that the date chosen for the contest (19 April) was Israel's Remembrance Day that year. The Dutch offered to host the contest after several other broadcasters (including the BBC) were unwilling to do so. The reluctance of those national broadcasters to stage the contest were due to already having hosted the event during the past couple of years, in addition to the expense involved. With the invitation of Australia to participate since 2015, it was announced that due to the logistical and financial issues that would occur if Australia were to host, in the event of an Australian victory, the broadcaster SBS will co-host the next contest in a European city in collaboration with an EBU Member Broadcaster of their choice. However, this has yet to happen and since 1981, all contests have been held in the country which won the previous year. The former generic logo was introduced for the 2004 Eurovision Song Contest in Turkey, to create a consistent visual identity. The host country's flag appears in the heart of the generic logo. Each year of the contest, the host country creates a sub-theme which is usually accompanied and expressed with a sub-logo and slogan. The theme and slogan are announced by the EBU and the host country's national broadcaster. The generic logo was revamped in 2014, ten years after the first generic logo was created. The revamped logo was conducted by lead designer Cornelis Jacobs and his team of Cityzen Agency. The logo was used for the first time in the 2015 Eurovision Song Contest, the 60th anniversary of the contest. Since the 2002 contest, slogans have been introduced in the show (2009 being the only exception). The slogan is decided by the host broadcaster and is then used to develop a visual design for the contest. 2006 Greece Athens Feel the Rhythm! 2011 Germany Düsseldorf Feel Your Heart Beat! 2012 Azerbaijan Baku Light Your Fire! 2018 Portugal Lisbon All Aboard! The term "Eurovision Week" is used to refer to the week during which the Contest takes place. As it is a live show, the Eurovision Song Contest requires the performers to have perfected their acts in rehearsals for the programme to run smoothly. In addition to rehearsals in their home countries, every participant is given the opportunity to rehearse on the stage in the Eurovision auditorium. These rehearsals are held during the course of several days before the Saturday show, and consequently the delegations arrive in the host city many days before the event. Journalists and fans are also present during the preceding days, and so the events of Eurovision last a lot longer than a few hours of television. A number of officially accredited hotels are selected for the delegations to stay in, and shuttle-bus services are used to transport the performers and accompanying people to and from the contest venue. Each participating broadcaster nominates a Head of Delegation, whose job it is to co-ordinate the movements of the delegate members, and who acts as that country's representative to the EBU in the host city. Members of the delegations include performers, lyricists, composers, official press officers and—in the years where songs were performed with a live orchestra—a conductor. Also present if desired is a commentator: each broadcaster may supply their own commentary for their TV and/or radio feed, to be broadcast in each country. The commentators are given dedicated commentary booths situated around the back of the arena behind the audience. Since 2004, the first rehearsals have commenced on the Sunday almost two weeks before the Grand Final. There are two rehearsal periods for each country. The countries taking part in the semi-finals have their first rehearsal over four days from the first Sunday to Wednesday. The second is from Thursday to Sunday. The countries which have already directly qualified for the Grand Final rehearse on the Saturday and Sunday. After each country has rehearsed, the delegation meets with the show's artistic director in the video viewing room. Here, they watch the footage of the rehearsal just performed. At this point the Head of Delegation may make known any special requirements needed for the performance, and request them from the host broadcaster. Following this meeting, the delegation hold a press conference where members of the accredited press may pose them questions. The rehearsals and press conferences are held in parallel; so one country holds its press conference, while the next one is in the auditorium rehearsing. A printed summary of the questions and answers which emerge from the press conferences is produced by the host press office, and distributed to journalists' pigeon-holes. Before each of the semi-finals three dress rehearsals are held. Two rehearsals are held the day before (one in the afternoon and the other in the evening), while the third is held on the afternoon of the live event. Since tickets to the live shows are often scarce, tickets are also sold so the public may attend these dress rehearsals. The same applies for the final, with two rehearsals on the Friday and the third on Saturday afternoon before the live transmission of the grand final on Saturday evening. For both semi-finals and for the final, the second dress rehearsal is also the Jury Final, this is where the jury from each country casts their votes. This means that 50% of the result is already decided before the live contests have taken place. On the Monday evening of Eurovision Week, a Mayor's Reception is traditionally held, where the city administration hosts a celebration that Eurovision has come to their city. This is usually held in a grand municipally owned location in the city centre. All delegations are invited, and the party is usually accompanied by live music, complimentary food and drink and—in recent years—fireworks. A Euroclub is held every night of the week: this is a Eurovision-themed nightclub, to which all accredited personnel are invited. During the week many delegations have traditionally hosted their own parties in addition to the officially sponsored ones. However, in the new millennium the trend has been for the national delegations to centralise their activity and hold their celebrations in the Euroclub. Numerous detailed rules must be observed by the participating nations, and a new version is produced each year, for instance the rules specify various deadlines, including the date by which all the participating broadcasters must submit the final recorded version of their song to the EBU. The rules also cover sponsorship agreements and rights of broadcasters to re-transmit the show. The most notable rules which affect the format and presentation of the contest have changed over the years, and are highlighted here. All vocals must be sung live; no voices are permitted on the backing tracks. In 1999, the Croatian song performed by Doris Dragović and composed by Tonči Huljić featured sounds on their backing track which sounded suspiciously like human voices. The Croatian delegation stated that there were no human voices, but only digitally synthesised sounds which replicated vocals. The EBU nevertheless decided that they had broken the spirit of the rules, and docked them 33% of their points total that year for the purpose of calculating their five-year points average for future qualification. From 1956 until 1998, the host country was required to provide a live orchestra. Before 1973, all music had to be played by the host orchestra. From 1973 onwards, pre-recorded, non-vocal backing tracks were permitted—although the host country was still obliged to provide a live orchestra to give participants a choice. If a backing track was used, then all the instruments heard on the track were required to be present on the stage. In 1997 this requirement was dropped. In 1999 the requirement for a live orchestra was removed: it was left as an optional contribution. The host that year, Israel's IBA, decided not to use an orchestra to save expenses, and thus 1999 was the first year when all the songs were played as pre-recorded backing tracks (in conjunction with live vocals). Each submission must have vocals; purely instrumental music has never been allowed. In the past, competitors have been required to sing in one of their own national languages, but this rule has been changed several times over the years. From 1956 until 1965, there was no rule restricting the languages in which the songs could be sung. In 1966 a rule was imposed stating that the songs must be performed in one of the official languages of the country participating, after Sweden was the first country to not sing in their own language, with opera singer Ingvar Wixell performing Sweden's 1965 entry in English. The Swedish-language version of the song was originally selected at Melodifestivalen 1965, but it was later translated into English for the Eurovision contest. The language restriction continued until 1973, when performers were again allowed to sing in any language they wished. Several winners in the mid-1970s took advantage of this: performers from non-English-speaking countries sang in English, including ABBA in 1974. In 1977, the EBU decided to revert to the national language restriction. However, special dispensation was given to Germany and Belgium as their national selections had already taken place before the decision was made; both countries' entries that year were in English. In 1999 the rule was changed again to allow the choice of language once more, which resulted in 12 out of 23 countries, including the United Kingdom, singing in English that year. Belgium entered the 2003 contest with "Sanomi", a song sung in a constructed language, finishing in second place. In 2006 the Dutch entry, "Amambanda", was sung partly in English and partly in an artificial language. In 2008 the Belgian entry, "O Julissi", was sung in an artificial language. In 2011 the Norwegian entry, "Haba Haba", which was sung in English and Swahili, was the first song to be sung in an African language, apart from Arabic. Since the language rule was abolished in 1999, songs in English have become increasingly more common. In 2016 all but three out of 36 semi-finalists had songs in English, with only two (Bosnia and Herzegovina and Macedonia) performing songs in their native languages, as Austria sent a song in French. In the final, all but three out of 26 contestants had songs in English. After Salvador Sobral's win in 2017 with a Portuguese-language song, the 2018 edition saw a significant increase in the use of native languages, with twelve of 43 participants singing in their country's native language (not including Estonia, whose representative opted to sing in Italian). The voting system used in the contest has changed over the years. The current system has been in place since 2016, and is a positional voting system. Each country awards two sets of 12, 10, 8–1 points to their 10 favourite songs: one from their professional jury of votes of five music professionals and the other from televoting. Historically, a country's votes were decided by an internal jury, but in 1997 five countries (Austria, Switzerland, Germany, Sweden and the United Kingdom) experimented with televoting, giving members of the public in those countries the opportunity to vote en masse for their favourite songs. The experiment was a success, and from 1998 onwards all countries were encouraged to use televoting wherever possible. Back-up juries are still used by each country, in the event of a televoting failure. Nowadays members of the public may also vote by SMS, in addition to televoting. In every case, every country cannot vote for its own song From 2013, the public may also vote via a mobile app. The current method for ranking entries, introduced in 2016, is to sum together the points calculated from the telephone vote and the jury separately. Prior to this, the jury and televoting rankings were combined 50/50 before the number of points were calculated. It was first used in the final of the 2009 edition, and extended the following year to the semi-finals. Since 1964 the voting has been presided over by the EBU scrutineer, who is responsible for ensuring that all points are allocated correctly and in turn. Since 2011, the Executive Supervisor was supported by an Event Supervisor, to oversee and coordinate all event-related matters on behalf of the EBU. Sietse Bakker served in the role for the first six years, replaced by Nadja Burkhardt. According to one study of Eurovision voting patterns, certain countries tend to form "clusters" or "cliques" by frequently voting in the same way. After the interval act is over, when all the points have been calculated, the presenter(s) of the show call upon each voting country in turn to invite them to announce the results of their vote. Prior to 1994 the announcements were made over telephone lines; with the audio being piped into the auditorium for the audience to hear, and over the television transmission. However, since and including 1994 the announcements have been presented visually. Often the opportunity is taken by each country to show their spokesperson standing in front of a backdrop which includes a famous place in that country. For example, the French spokesperson might be seen standing in front of the Eiffel Tower or an Italian presenter might be seen with the Colosseum in the background. From 1957 to 1962, the participating countries were called in reverse order of the presentation of their songs, and from 1963 to 2003, they were called in the same order in which their songs had been presented (except for 1974). Since 2004, when semi-finals were introduced, the order of the countries' announcements of votes has changed; and the countries that did not make it to the final each year could also vote. In 2004, the countries were called in alphabetical order (according to their ISO codes). In 2005, the votes from the non-qualifying semi-finalists were announced first, in their running order on the Thursday night; then the finalists gave their votes in their own order of performance. Between 2006 and 2010, like in 1974, a separate draw was held to determine the order in which countries would present their votes. From 2011 to 2015, the voting order was determined by the results of a jury the day before the final so as to create as much suspense as possible when the votes were revealed. From 1971 to 1973, each country sent two jurors, who were present at the contest venue (though the juries in 1972 were locked away in the Great Hall of Edinburgh Castle) and announced their votes as the camera was trained on them. In 1973 one of the Swiss jurors made a great show of presenting his votes with flamboyant gestures. This system was retired the next year. In 1956 no public votes were presented: a closed jury simply announced that Switzerland had won. From 1957 to 1987, the points were displayed on a physical scoreboard to the side of the stage. As digital graphic technology progressed, the physical scoreboards were superseded in 1988 by an electronic representation which could be displayed on the TV screen at the will of the programme's director. In 2006 the EBU decided to save time during the broadcast—much of which had been taken up with the announcement of every single point—because there was an ever-increasing number of countries voting. Since then, votes from 1 to 7 from each country have been displayed automatically on screen and the remaining points (8, 10 and 12) are read out in ascending order by the spokesperson, culminating with the maximum 12 points. Countries must announce the country names and points in either English or French and the scores are repeated by the contest's presenters in the other language. For this reason, the expression douze points when the host or spokesperson states the top score in French is popularly associated with the contest throughout the continent. 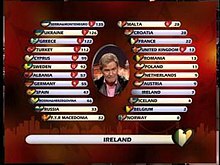 Since 2016, only the name of the top jury votegetter is announced, with the points awarded to the other 9 countries shown in an on-screen scoreboard during the announcement. In addition, only the jury points are announced by country. The televoting results are announced in aggregate, from lowest-scoring country to highest. After the winner has been announced, the televoting points from the country where the contest is watched from are briefly seen on screen. In 1969, four of the sixteen countries taking part, France, Spain, the Netherlands and the United Kingdom, all tied for first place with 18 points each. There was nothing in the rules to decide an outright winner, so all four were declared joint winners. This caused much discontent among most of the other participating countries, and mass walkouts were threatened. Finland, Norway, Sweden and Portugal did not participate in the 1970 Contest as a protest against the results of the previous year. This prompted the EBU to introduce a tie-break rule. Under the current rules, in the event of more than one country scoring the same total number of points, a count is made of the numbers of countries who awarded points to each of the tied countries, and the one who received points from the most countries is declared the winner. If the numbers are still tied, it is counted how many sets of maximum points (12 points) each country received. If there is still a tie, the numbers of 10-point scores awarded are compared—and then the numbers of 8-point scores, all the way down the list. In the extremely unlikely event of there then still being a tie for first place, the song performed earliest in the running order is declared the winner. Since 2008, the same tie-break rule now applies to ties for all places. As of 2019, the only time since 1969 when two or more countries have tied for first place on total points alone was in 1991, when France and Sweden both totalled 146 points. At that time, the rules did not include counting the numbers of countries awarding any points to these countries' songs, but began with tallying up the numbers of 12-point scores awarded. Both France and Sweden had received four sets of 12 points. However, because Sweden had received more sets of 10-point scores, they were declared the winners. Had the current rule been in play, France would have won instead. Each participating broadcaster is required to broadcast the show in its entirety: including all songs, recap, voting and reprise, skipping only the interval act for advertising breaks if they wish. From 1999 onwards, broadcasters who wished to do so were given the opportunity to take more advertising breaks as short, non-essential hiatuses were introduced into the programme. Four major interruptions or preemptions of the contest broadcast have taken place since 1999. The Dutch state broadcaster pulled their broadcast of the 2000 final to provide emergency news coverage of a major incident, the Enschede fireworks disaster. Spain's RTVE delayed their broadcast of the second semi-final in the 2009 Contest, due to the Madrid Open tennis tournament. The Albanian state broadcaster deferred their broadcast of the first semi-final in 2012 to provide emergency news coverage of the Qafa e Vishës bus accident. In 2018, Chinese broadcaster Mango TV edited the Albanian and Irish songs out of their broadcast of the first semi-final for violations of Chinese broadcast regulations. The Albanian performer had visible tattoos, and the Irish song featured a storyline showing vignettes of a homosexual couple. Eurovision terminated Mango's broadcasting rights when the broadcaster refused to agree to air the second semi-final and the grand final unedited. The first edition ever of the Eurovision Song Contest in 1956 was broadcast live, but not recorded, so only a sound recording of the radio transmission has survived from the original broadcast. The ninth edition in 1964 hosted by Danmarks Radio was recorded on tape, but a fire destroyed the recording, and it is unknown if any other TV station in Europe has another copy. Only small portions of the original broadcast and audio from the radio transmission have survived. In 1978, hosted in Paris only a month after the 1978 South Lebanon conflict, during the performance of the Israeli entry, the Jordanian broadcaster JRTV suspended the broadcast and showed pictures of flowers. When it became apparent during the later stages of the voting sequence that Israel's song "A-Ba-Ni-Bi" was going to win the contest, JRTV abruptly ended the transmission. Afterwards, the Jordanian news media refused to acknowledge that Israel had won and announced that the winner was Belgium (who had actually come in 2nd place). In 1981 JRTV did not broadcast the voting because the name of Israel appeared on the scoreboard. In 2005, Lebanon intended to participate in the contest. However, Lebanese law does not allow recognition of Israel, and consequently Lebanese broadcaster Télé Liban did not intend to transmit the Israeli entry. The EBU informed them that such an act would breach the rules of the contest, and Lebanon was subsequently forced to withdraw from the competition. Their late withdrawal incurred a fine, since they had already confirmed their participation and the deadline had passed. However, the Eurovision Song Contest albums were still being sold in Lebanese music stores until 2009, with the word Israel erased from the back cover. As of 2010[update], the albums were banned completely from sale. In 2009, the song "We Don't Wanna Put In" was selected to represent Georgia. However, the song text was banned by Eurovision as it was interpreted as criticism against Prime Minister of Russia Vladimir Putin after the Russo-Georgian War the previous year. When asked to change the lyrics of the song, the Georgian broadcaster GPB withdrew from the 2009 contest. In the first contest in 1956, there was a recommended time limit of 3​1⁄2 minutes per song. In 1957, despite protests, Italy's song was 5:09 minutes in duration. This led to a stricter time limit of 3 minutes precisely. Since the three-minute time limit was adopted in 1960, some artists have had songs longer than three minutes, which must be edited down to 3 minutes, though some songs exceed that time by a few seconds. Many of the entries also have longer versions (including different languages) for commercial release, and since the 1990s, some are released in additional remixed versions. The EBU imposes no restrictions on the nationalities of the performers or songwriters. Individual broadcasters are, however, permitted to impose their own restrictions at their discretion. About a dozen artists have performed more than once in the Contest representing different countries, and some of the winners were not born in the country they represented. From 1957 to 1970 (in 1956 there was no restriction at all) only soloists and duos were allowed on stage. From 1963, a chorus of up to three people was permitted. Since 1971, a maximum of six performers have been permitted on the stage. The performance and/or lyrics of a song "must not bring the Contest into disrepute". No lyrics, speeches, gestures of a political or similar nature are permitted. No swearing or unacceptable language is allowed, neither are commercial messages. From 1990 onwards, all people on stage must be at least 16 years of age. Each artist may perform for only one country per year. The music and text must not have been published or performed before 1 September of the year before the contest is held. Many countries also have the additional rule that the song shall never have been performed before the relevant national Eurovision Contest. Covers, reworked or sampled versions of older songs are not allowed. Regular participants in 1992. Yugoslavia is coloured in red: 1992 was the last year in which that nation participated under one name. Regular participants in 1994. Changes from 1992 include the addition of Central and Eastern European countries, and the separation of ex-Yugoslavian states. The number of countries participating has steadily grown over time, from seven in 1956 to over 20 in the late 1980s. In 1993, twenty-five countries participated in the competition, including, for the first time, Bosnia-Herzegovina, Croatia and Slovenia, entering independently due to the dissolution of Yugoslavia. In the most recent edition in 2018, a total of 43 countries took part, with 26 appearing in the final. Because the contest is a live television programme, a reasonable time limit must be imposed on the duration of the show. In recent years the nominal limit has been three hours, with the broadcast occasionally over-running. Since 1993, and following the cessation of the Eastern European OIRT network and the merger with the EBU, there have been more entries than there is time to reasonably include in a single TV show. Several relegation or qualification systems have been tried to limit the number of countries participating in the contest at one time. Thus the 1993 Contest introduced two new features: first, a pre-selection competition was held in Ljubljana in which seven new countries fought for three places in the international competition. Bosnia-Herzegovina, Croatia, Estonia, Hungary, Romania, Slovenia and Slovakia took part in Kvalifikacija za Millstreet; and the three former Yugoslav republics, Bosnia-Herzegovina, Croatia and Slovenia, qualified for a place in the international final. Also to be introduced that year was "relegation": the lowest-placed countries in the 1993 score table were not invited in 1994, to allow the countries which failed the 1993 pre-selection into the 1994 Contest. The 1994 Contest included—for the first time—Estonia, Romania, Slovakia, Lithuania, Hungary, Poland and Russia. Relegation continued in 1994 and 1995; but in 1996 a different pre-selection system was used, in which nearly all the countries participated. Audio tapes of all the songs were sent to juries in each of the countries some weeks before the television show. These juries selected the songs which would be included in the international broadcast. Norway, as the host country in 1996 (having won the previous year), automatically qualified and so did not need to go through pre-selection. One country which failed to qualify in the 1996 pre-selection was Germany. As one of the largest financial contributors to the EBU, their non-participation in the contest brought about a funding issue, which the EBU would have to consider. Since 2000, France, Germany, Spain and United Kingdom have automatically qualified for the final, regardless of their positions on the scoreboard in previous contests, as they are the four biggest financial contributors to the EBU. These countries became known as the "Big Four". On 31 December 2010, it was announced that Italy would compete in the Eurovision Song Contest after a fourteen-year absence and that it would also automatically qualify for the final, joining the other four qualifiers to become the "Big Five". Germany became the first and, as of 2018[update], the only "Big Five" country to win the contest since the rule was made in 2000, when Lena Meyer-Landrut won the 2010 Contest. Turkey withdrew from the 2013 Contest with the status of the "Big Five" being one of the reasons cited. They also did not participate in the following 6 years' of contests (2014–19) for similar reasons, as well as stating their opposition to the 50/50 jury and televoting system that began being applied in the final of the 2009 Contest. It is sometimes discussed whether the Big 5 measure benefits or perjudicates the countries' performances on the festival. The only country in the Big 5 (since 2011) that has never finished last in the finals is Italy. Some measures have been taken by the EBU to give the Big 5 contestants a similar status to those competing at the semi-finals, such as broadcasting their acts in the semi-final interval. From 1997 to 2001, countries qualified for each contest based on the average of their points totals for their entries over the previous five years. However, there was much discontent voiced over this system because a country could be excluded merely because of poor previous results, which did not take into account how good a fresh attempt might be. The worst example of this was that Bosnia and Herzegovina finished 7th with 86 points in the 1999 Contest, but it wasn't enough to save the country being relegated from taking part in the 2000 Contest. This led the EBU to create what was hoped would be a more permanent solution to the problem. A qualification round, known as the semi-final, was introduced for the 2004 Contest. This semi-final was held on the Wednesday during Eurovision Week, and was a programme similar in format to the grand final, whose time slot remained 19:00 UTC on the Saturday. The highest-placed songs from the semi-final qualified for the grand final, while the lower-placed songs were eliminated. From 2005 to 2007, the semi-final programme was held on the Thursday of Eurovision Week. In these two shows there was enough time to include all the countries who wished to participate. The ten highest-placed non-Big Four countries in the "grand final" were guaranteed a place in the following year's grand final, without having to qualify. If, for example, Germany came in the top ten, the eleventh-placed non-Big-Four country would automatically qualify for the next year's grand final. The remaining countries—which had not automatically qualified for the grand final—had to enter the semi-final. 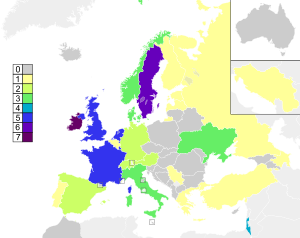 At the 50th annual meeting of the EBU reference group in September 2007, it was decided that, with still more nations entering, starting from the 2008 contest onwards two semi-finals would be held, from each of which one could qualify for the final. From 2008 onwards, the scoreboard position in previous years has not been relevant, and—save for the automatic qualifiers—all participating countries have had to participate in the semi-finals, regardless of their previous year's scoreboard position. The only countries which automatically qualify for the grand final are the host country and the Big Five: France, Germany, Italy, Spain and the United Kingdom, who continue to enjoy their protected status. In each of the semi-finals the voting is conducted among those countries which participate in that semi-final. With regard to the automatic grand final qualifiers, who do not participate in the semi-finals, a draw is conducted to determine in which semi-final each of them will be allowed to vote. In contrast, every participating country in a particular year may vote in the Saturday grand final – whether their song qualified for the final or not. The ten countries which receive the most votes in each semi-final qualify for the grand final. They are announced by the presenters in English and French, in a random order. Full voting results are withheld until after the grand final, whereupon they are published on the EBU's website. To date only two countries have always qualified to the Final since the implementation of the semi-finals system in 2004: Australia and Ukraine. As of 2018[update], Ireland holds the record for the highest number of wins, having won the contest seven times. Sweden is second with six wins. France, Luxembourg and the United Kingdom are joint third with five wins each. The Netherlands and Israel both hold four victories. Denmark and Norway have both won thrice, six countries have won twice, 12 countries have won once, and 24 countries have participated but never won. The United Kingdom holds the record for the highest number of runner-up placings, coming in second on no less than 15 occasions as of 2018[update]. Germany, Russia, France, Spain and Ireland have four runner-up entries. Norway holds the record for finishing in last place in the final the most times: eleven. Israel is the only non European country to win with 4 wins. The early years of the contest saw many wins for "traditional" Eurovision countries: France, the Netherlands, and Luxembourg. However, the success of these countries has declined in recent decades; the Netherlands last won in 1975; France, in 1977; and Luxembourg, in 1983. Luxembourg last entered the contest in 1993. The first years of the 21st century produced numerous first-time winners, from both "new" and long-serving countries who had previously entered numerous times but without victories. Every year from 2001 to 2008 inclusive, a country won for its first time. Estonia was the first post-Soviet country to win the competition in 2001. In 2003, Turkey won for the first time. In 2005, Greece won for the first time, 15 years after the last Southern European country won, i.e. Italy in 1990; overall the South of Europe won the competition only six times (seven if Serbia is included). The 2006 winner was Finland's Lordi, earning Finland's first win after having entered the contest for 45 years. Ukraine, on the other hand, did not have to wait so long, winning with only their second entry in 2004. Also notably, although not the nation's first win, Conchita Wurst's win in 2014 broke a 48-year losing run for Austria. The contest was won by Russia in 2008. Serbia won the very first year it entered as an independent state, in 2007, with the Serbian-language ballad "Molitva". In 2004, Serbia and Montenegro also almost won the initial year it entered as a competitor state, finishing up second behind Ukraine, also with a ballad in Serbian language. Other relatively quick winners were Latvia, who won in 2002, only their third year competing, and Azerbaijan, who won in 2011 in only their fourth year in the competition. When Portugal won in 2017, they ended a 49-year run of entering without a win, beating Finland's previous record of 45 years. Cyprus now holds this record, with 35 years without a win, achieving their highest score, Second, in 2018, and Malta is the most successful country without a win, achieving two-second places and two third places. In 2009, Norway won the contest with 387 points – Alexander Rybak held the winning title with his song "Fairytale". His outstanding performance meant he had the highest total in the history of the competition, becoming the first competitor to score 300 or more points, including 16 maximum scores. This feat was emulated in 2012, when Sweden won with 372 points, but with a new record of 18 maximum scores. In 2015, Sweden won the contest with 365 points, becoming the first country to ever reach 300 points or more twice while winning both times. Russia placed second with 303 points, becoming the first country to score more than 300 points without winning. In 2016, the scoring system was changed, which meant that it was much easier to achieve over 300 points – in fact, the winner – Jamala of Ukraine, achieved 534 points, and all of top 9 scored 200 or more points, and 25 of the 26 positions got their highest points ever. This feat was then extended in 2017 when Salvador Sobral beat Ukraine's points record by 224 points, in addition to Bulgaria beating the same score by 81 points. However, had Portugal won under the previous voting system, it would still have had the highest total ever, with 417 points, becoming the first competitor to score 400 or more points, and would have set a new record of 20 maximum scores, beating Norway and Sweden, respectively. Since the introduction of the 50/50 voting system in 2009, the juries and the voters have disagreed on the winner on four occasions, in 2011, 2015, 2016, and 2018. 2011 winner Azerbaijan won only the televotes (jury votes were won by Italy) and 2015 winner Sweden won only the jury votes (televotes were won by Italy). In 2016, Ukraine did not win either the jury vote or the televote, but won the contest with the highest combined vote. The televote was won by Russia and the jury vote by Australia. In 2018, eventual winner Israel won the televote but only came in third with the jury vote (won by Austria). There have been a number of Eurovision artists and groups whose careers were directly launched into the spotlight following their win. Notable examples were ABBA, who won the contest for Sweden in 1974 with their song "Waterloo", and went on to become one of the most successful pop bands in history; the French Canadian singer Céline Dion, who won the contest for Switzerland in 1988 with the song "Ne partez pas sans moi", which subsequently helped launch her international career; and the winners of the 1981 contest, Bucks Fizz for the United Kingdom with the song "Making Your Mind Up", which also launched a successful international career. Other artists who have achieved varying degrees of success after winning the contest include France Gall ("Poupée de cire, poupée de son", Luxembourg 1965), Dana ("All Kinds of Everything", Ireland 1970), Vicky Leandros ("Après toi", Luxembourg 1972), Brotherhood of Man ("Save Your Kisses for Me", United Kingdom 1976), and Johnny Logan (who won twice for Ireland, with "What's Another Year" in 1980 and "Hold Me Now" in 1987). Several other winners were well-known artists who won the contest mid-career after they had already established themselves, including Katrina and the Waves, winners in 1997 with "Love Shine a Light", Lulu, winner in 1969 with "Boom Bang-a-Bang", and Sandie Shaw, winner in 1967 with "Puppet on a String". Women have dominated the contest since its inception, either performing solo or as a member of a group on 50 of the 67 winning entries as of 2018[update]. The 2017 winner was a solo male performance by Salvador Sobral. However, his sister and the song's composer Luísa Sobral joined him for the winner's reprise. The most recent winner of the contest is Netta Barzilai who won the 2018 contest for Israel. In 1981, a concert television programme was held to commemorate the contest's twenty-fifth anniversary. The event, entitled Songs of Europe, took place in Mysen, Norway, featuring nearly all the winners of the contest, from 1956 to 1981. It was hosted by Rolf Kirkvaag and Titten Tei. In 2005, the EBU had agreed with the Danish broadcaster, DR, to produce a programme to celebrate the 50th anniversary of the Eurovision Song Contest. The show, entitled Congratulations: 50 Years of the Eurovision Song Contest after Cliff Richard's 1968 entry for the United Kingdom, was held in Copenhagen, and featured a competition among fourteen of the most popular songs from the last 50 years of the contest. A telephone vote was held to determine the most popular Eurovision song of all-time, which was won by the ABBA song "Waterloo" (winner for Sweden in 1974). The event was hosted by the 1997 Contest winner for the United Kingdom, Katrina Leskanich, and Latvia's representative on its debut at the 2000 Contest, Renārs Kaupers. In 2015, the EBU had decided again to commemorate the contest and agreed with the United Kingdom's broadcaster, BBC, to produce a show for the 60th anniversary of the contest, after evaluating several proposals from member broadcasters in regards to the anniversary celebration beyond the 2015 Contest in May. The event, entitled Eurovision Song Contest's Greatest Hits, took place at the Eventim Apollo in Hammersmith, London and featured fifteen acts from thirteen countries in the official line-up. Unlike the 50th anniversary show in 2005 which was broadcast live, this event did not feature a competition and was pre-recorded to be televised across Europe and other EBU members on various dates schedule by the respective broadcasters. The event was hosted by the British commentator for Eurovision, Graham Norton, and the host of the 2013 and 2016 Contest, Petra Mede. The contest has been the subject of criticism regarding both its musical and political content. For example, on rare occasions, certain countries have been booed when performing or receiving points, especially when being given by a neighbour country. Most recently in 2014 and 2015, Russia was heavily booed when it qualified for the final and received high points. The reason for the booing is considered to be due to the Russian military intervention in Ukraine and opposition to the country's policy on LGBT rights. Because the songs play to such a diverse supranational audience with contrasting musical tastes, and countries want to be able to appeal to as many people as possible to gain votes, this has led to the music of the contest being characterised as a "mishmash of power ballads, ethnic rhythms and bubblegum pop". This well-established pattern, however, was notably broken in 2006 with Finnish metal band Lordi's victory. As Eurovision is a visual show, many performances attempt to attract the attention of the voters through means other than the music, notably elaborate lighting sequences and pyrotechnics; sometimes leading to bizarre on-stage theatrics and costumes, including the use of revealing dress. The contest has long been accused by some of political bias; the perception is that judges and televoters allocate points based on their nation's relationship to the other countries, rather than the musical merits of the songs. According to one study of Eurovision voting patterns, certain countries tend to form "clusters" or "cliques" by frequently voting in the same way. Another study concludes that as of 2006, voting blocs have, on at least two occasions, crucially affected the outcome of the contest. On the other hand, others argue that certain countries allocate disproportionately high points to others because of similar musical tastes and cultures and because they speak similar languages, and are therefore more likely to appreciate each other's music. A recent study in presents a new methodological approach which allows an analysis of the whole time-line of the contest (from 1957 to 2017) to investigate collusion and the cluster blocks which have been changing. It allows the analysis to find collusive associations over periods where the voting scheme is non-homogeneous in the time window chosen, and the results show a changing pattern in the collusive tendencies previously discussed. The current research into the analysis of the voting patterns has been used in notable sources, such as the Economist, for investigating whether over 10-year periods such collusion is increasing or decreasing. Produced using the methods presented in and a network of the significant score deviations can be viewed over a time period of interest. As an example, Terry Wogan, the United Kingdom's well-known presenter of Eurovision since 1980 and one of the only three presenters mentioned by name during the contest proper stood down from the BBC One's broadcast in 2008 saying "The voting used to be about the songs. Now it's about national prejudices. We [the United Kingdom] are on our own. We had a very good song, a very good singer, we came joint last. I don't want to be presiding over another debacle". Another influential factor is the high proportion of expatriates and ethnic minorities living in certain countries. Although judges and televoters cannot vote for their own country's entry, expatriates can vote for their country of origin. The total numbers of points to be distributed by each country are equal, irrespective of the country's population. Thus voters in countries with larger populations have less power as individuals to influence the result of the contest than those voting in smaller countries. For example, San Marino holds the same voting power as Russia despite the vast geographic and population differences between them. To try to reduce the effect of voting blocs, national juries were re-introduced alongside televoting in the final in 2009: each contributing 50% of the vote. This hybrid system was expanded in 2010 to also be implemented in the semi-finals. However, since 1994 no country has won two years in a row, and semi-finals have also been won by different countries, until 2012 when Sweden won the second semi-final in 2011 and 2012. Although many of them used to give their 12 points to the same country each year, like Cyprus and Greece, it has been noticed that factors such as the sets of other high votes received (7, 8 or 10 points) and the number of countries giving points to a specific entry, also highly affect the final positions. An overview of the overall preference between countries that exhibits patterns of high score allocations is a question that appears frequently and recently a new study investigates the question of 'neglect' in the competition. The concept of 'neglect' here is represented by countries which produce patterns of biased low score allocations to certain countries. Together these two patterns provide a better view of the competition's intrinsic country pair biases. Result of such a study are presented in,. From the analysis it can be seen that countries which exhibit these biases do not receive a penalization from other participants and it presents itself as a means to accumulate more points by establishing these partnerships. From 2013 onwards, the final and the semi-finals running order of the competing performances at the semi-finals and the final has been decided by the show's producers and then approved by the EBU Executive Supervisor and the Reference Group. An "allocation draw" occurs for the final and the semi-finals with each nation drawing to perform in the first or second half. Prior to 2013, the order was decided at random (though when the host nation performs is still decided at random, to ensure fairness). There is some statistical evidence that the contest's results were positively related to the running number in 2009–2012. The change in procedure was aimed to make the show more exciting and ensure that all contestants had a chance to stand out, preventing entries that are too similar from cancelling each other out. The decision elicited mixed reactions from both fans and participating broadcasters. Some fans have alleged that there is a risk of corruption and that the order can be manipulated to benefit certain countries, since the running order is considered to be of importance to the result. As of the 2018 contest, the only regularly contested positions in the running order that have never won the contest are numbers 2 and 16, with position number 21 winning for the first time in 2016. Position 17 has the most victories, with 7. Positions 25, 26 and 27 have not won either, but there have been very few finals with that many participants. A number of spin-offs and imitators of the Eurovision Song Contest have been produced over the years, some national and others international. Sopot International Song Festival (1961–80, 1984–2003, 2005–09, 2012–14, 2017–), held in Sopot, Poland. Östersjöfestivalen also called Baltic Song Contest (1967–present), held annually in Karlshamn, Sweden. Cân i Gymru (1969–72, 1974–), held annually in Wales, was intended to be BBC Cymru's pre-selection show when Wales expressed an interest in participating in the 1969 Eurovision Song Contest separately from the rest of the United Kingdom. Caribbean Song Festival (1984–), held annually between members of the Caribbean Broadcasting Union. Festivali i Këngës (1962–), held annually in Tirana, Albania, has been used to select Albania's entry for the Eurovision Song Contest since 2003. Liet-Lávlut (2002–), an annual competition between European Ethnic minorities and languages. First held in Friesland. Junior Eurovision Song Contest (2003–), for European artists under the age of 15. Asia Song Festival (2004–), held annually in South Korea. ABU Song Festivals (2012–), two Asia-Pacific versions, the biennial ABU Radio Song Festival and the annual ABU TV Song Festival. Turkvision Song Contest (2013–15, 2019–), an annual competition that launched in December 2013, for countries and autonomous regions that have Turkic links. AfriMusic Song Contest (2018–), an annual competition with African artists. Eurovision Asia Song Contest (2019), Asian counterpart with members of the Asia-Pacific Broadcasting Union. Castlebar Song Contest (1966–86, 1988), held annually in Castlebar, County Mayo, Ireland. Yamaha Music Festival, also called World Popular Song Festival (1970–87, 1989), held in Tokyo, Japan. OTI Festival (1972–98, 2000), competed and hosted by Portugal, Spain and the countries of the Americas. Countries could only sing in Spanish and Portuguese. Intervision Song Contest (1977–80, 2008), originally held by the Eastern Bloc countries of Europe and Finland. Now held by Post-Soviet states and members of the Shanghai Cooperation Organisation. MGP Nordic (2002, 2006–09), for artists under the age of 16 in Scandinavia and Finland. World Oriental Music Festival (2005), includes participants from Europe and Asia. Bundesvision Song Contest (2005–15), held annually between the 16 states of Germany. ^ The European Broadcasting Area was expanded in November 2007 by the World Radiocommunication Conference (WRC-07), also to include Armenia, Azerbaijan and Georgia. ^ "Winners of the Eurovision Song Contest" (PDF). European Broadcasting Union. Archived from the original (PDF) on 28 May 2008. Retrieved 26 December 2007. ^ "Eurovision recognised by Guinness World Records as the largest in the world and the longest-running annual TV programme (international)". Guinness World Records. 23 May 2015. ^ "Eurovision Trivia" (PDF). BBC Online. 2002. Retrieved 18 July 2006. ^ "Eurovision Song Contest 1972". European Broadcasting Union. Retrieved 21 July 2009. ^ "Eurovision Song Contest 2004 Final". European Broadcasting Union. Retrieved 22 July 2009. ^ Jordan, Paul (31 October 2016). "43 countries to participate in Eurovision 2017". eurovision.tv. European Broadcasting Union. Retrieved 31 October 2016. ^ a b "Serbia's "Prayer" wins Eurovision Song Contest". Reuters. 14 May 2007. ^ "Live Webcast". European Broadcasting Union. Archived from the original on 25 May 2006. Retrieved 25 May 2006. ^ "Finland wins Eurovision contest". Al Jazeera English. 21 May 2006. Retrieved 8 May 2007. ^ Murray, Matthew. "Eurovision Song Contest – International Music Program". Museum of Broadcast Communications. Archived from the original on 13 January 2005. Retrieved 15 July 2006. ^ Philip Laven (July 2002). "Webcasting and the Eurovision Song Contest". European Broadcasting Union. Archived from the original on 28 May 2008. Retrieved 21 August 2006. ^ a b c Staff (17 May 2005). "Singing out loud and proud". Bristol Evening Post. Daily Mail and General Trust. In the mid-1950s, the members of the European Broadcasting Union set up an ad hoc committee to investigate ways of rallying the countries of Europe round a light entertainment programme. The European Broadcasting Union (EBU) was formed on 12 February 1950 by 23 broadcasting organisations from Europe and the Mediterranean at a conference in Devon, United Kingdom. It was on 6 June 1954, that Montreux became the venue for the first transmission by the EBU's Eurovision Network of the Narcissus Festival and its flower-bedecked procession floats. At Monaco, in late January 1955, this committee, chaired by Marcel Bezençon, director general of Swiss Television, came up with the idea of creating a song contest, inspired by the very popular San Remo Festival. The idea was approved by the EBU General Assembly in Rome on 19 October 1955, and it was decided that the first "Eurovision Grand Prix" – so baptised, incidentally, by a British journalist – would take place in spring 1956 at Lugano, Switzerland. ^ a b c Jaquin, Patrick (1 December 2004). "Eurovision's Golden Jubilee". European Broadcasting Union. Archived from the original on 11 August 2004. Retrieved 18 July 2009. ^ "History of Eurovision". BBC Online. 2003. Archived from the original on 1 February 2010. Retrieved 20 July 2006. ^ a b Waters, George T. (Winter 1994). "Eurovision: 40 years of network development, four decades of service to broadcasters". European Broadcasting Union. Archived from the original on 27 June 2006. Retrieved 15 July 2006. ^ a b c d e "Historical Milestones". European Broadcasting Union. 2005. Archived from the original on 26 May 2006. Retrieved 26 May 2006. ^ Thomas, Franck (1999). "Histoire 1956 à 1959" (in French). eurovision-fr.net. Archived from the original on 2 May 2006. Retrieved 17 July 2006. ^ "The EBU Operations Department". European Broadcasting Union. 14 June 2005. Archived from the original on 17 July 2006. Retrieved 20 July 2006. ^ "Voting fault hits Eurovision heat". BBC News. 13 May 2004. Retrieved 2 May 2010. ^ a b c d e f g h i "Rules for the Eurovision Song Contest 2009" (PDF). European Broadcasting Union. Retrieved 18 July 2009. ^ a b "Eurovision Song Contest 1974". European Broadcasting Union. Archived from the original on 5 June 2011. Retrieved 19 July 2009. ^ Barnes, Clive. "Riverdance Ten Years on". RiverDance. Retrieved 27 July 2006. ^ a b "Membership conditions". European Broadcasting Union. Retrieved 3 February 2012. ^ a b "ITU-R Radio Regulations 2012–15" (PDF). International Telecommunication Union, available from the Spectrum Management Authority of Jamaica. 2012. Archived from the original (PDF) on 16 August 2013. Retrieved 27 May 2013. ^ "ITU-R Radio Regulations – Articles edition of 2004 (valid in 2004–07)" (PDF). International Telecommunication Union. 2004. Archived from the original (PDF) on 10 October 2017. Retrieved 14 May 2014. ^ "Radio Regulations". International Telecommunication Union. 8 September 2005. Retrieved 18 July 2006. ^ Todd, Lucy (10 May 2018). "Eurovision 2018: Second semi-final sees Russia eliminated". BBC News. Retrieved 10 June 2018. ^ Herbert, Emily (23 November 2018). "Jon Ola Sand: "Participation of North African countries in Eurovision is possible". Retrieved 23 November 2018. ^ Granger, Anthony (19 October 2016). "ESC'17: Wording changes regarding associate member participation". Retrieved 23 November 2018. ^ "FAQ - Eurovision Song Contest". eurovision.tv. Retrieved 8 February 2019. ^ "Australia to compete in the 2015 Eurovision Song Contest". ""Eurovision Song Contest"". 10 February 2015. ^ "Eurovision Song Contest – Dusseldorf 2011 | News – JESC – Delegation leaders meet for Junior Eurovision 2008". Esctoday.com. Archived from the original on 9 June 2008. Retrieved 22 May 2011. ^ "Eurovision Song Contest: History". European Broadcasting Union. Retrieved 23 November 2009. ^ Waddell, Nathan (21 May 2015). "Australia: Australia may become a solid participant, says JOS". escXtra. Retrieved 21 May 2015. ^ Fawkes, Helen (19 May 2005). "Ukrainian hosts' high hopes for Eurovision". BBC News Online. Retrieved 19 July 2009. ^ "General Information on Millstreet" (PDF). Republic of Ireland. Archived from the original (PDF) on 18 July 2009. Retrieved 17 July 2009. ^ "Green Glens Arena". Town of Millstreet. Retrieved 19 July 2009. ^ "Reference group meets in Moscow". European Broadcasting Union. 12 September 2008. Retrieved 18 July 2009. ^ Marone, John. "Where Do We Put The Foreign Tourists?". The Ukrainian Observer. Archived from the original on 4 February 2006. Retrieved 18 July 2006. ^ a b c d e f g h i O'Connor, John Kennedy (2005). The Eurovision Song Contest 50 Years The Official History. London: Carlton Books Limited. ISBN 978-1-84442-586-0. ^ "Germany will host Eurovision if Australia wins, says Christer Björkman (UPDATED)". Wiwibloggs.com. Wiwibloggs. 22 April 2015. Retrieved 5 July 2016. ^ "Australia to make Eurovision Song Contest return in 2016". ebu.ch. European Broadcasting Union. 17 November 2015. Retrieved 3 March 2016. ^ Siim, Jarmo. "Eurovision Song Contest logo evolves". EBU. Retrieved 31 July 2014. ^ "Serbia in spotlight for Eurovision". BBC News. 23 May 2008. Retrieved 2 May 2010. ^ "Event weeks - Eurovision Song Contest". eurovision.tv. Retrieved 8 February 2019. ^ "Belgrade 2008". European Broadcasting Union. 17 March 2008. Archived from the original on 18 May 2008. Retrieved 19 July 2009. ^ a b c d e "Rules of the 2005 Eurovision Song Contest". European Broadcasting Union. 2005. Archived from the original on 10 February 2006. Retrieved 10 February 2006. ^ a b "Rehearsal Schedule" (PDF). European Broadcasting Union. 2008. Retrieved 19 July 2009. ^ "Interviews 2008". European Broadcasting Union. 2008. Retrieved 21 June 2009. ^ "The grand opening reception!". European Broadcasting Union. 11 May 2009. Retrieved 19 July 2009. ^ "After Show Party: Reactions". European Broadcasting Union. Retrieved 20 June 2009. ^ a b "The EuroClub: Official party venue opened its doors". European Broadcasting Union. Retrieved 18 July 2009. ^ a b "Eurovision Song Contest 1999". European Broadcasting Union. Retrieved 21 July 2009. ^ a b c d e "Rules of the 44th Eurovision Song Contest, 1999" (PDF). European Broadcasting Union. 13 October 1998. Retrieved 18 July 2006. ^ "Eurovision Song Contest 1973". European Broadcasting Union. Retrieved 21 July 2009. ^ "Eurovision Song Contest 1977". European Broadcasting Union. Retrieved 21 July 2009. ^ a b c Schacht, Andreas (9 March 2008). "Ishtar for Belgium to Belgrade!". European Broadcasting Union. Retrieved 19 July 2009. ^ Hondal, Victor (12 February 2011). "Norway sends Stella Mwangi to Eurovision 2011". EscToday.com. Retrieved 19 February 2011. ^ a b "Biggest change to Eurovision Song Contest voting since 1975". 18 February 2016. Retrieved 20 March 2016. ^ "People's Daily Online – Eurovision Song Contest semi-final held in Helsinki". English.people.com.cn. 11 May 2007. Retrieved 15 May 2011. ^ "Eurovision Song Contest app launched!". Eurovision.tv. 7 May 2013. Retrieved 3 November 2014. ^ "Download the official Eurovision app". Eurovision.tv. 3 November 2014. Retrieved 3 November 2014. ^ Bakker, Sietse (11 October 2009). "Exclusive: Juries also get 50% stake in Semi-Final result!". EBU. Retrieved 8 November 2014. ^ "Full Splitt Results". European Broadcasting Union. eurovision.tv. May 2014. Archived from the original on 26 November 2014. Retrieved 28 January 2015. ^ "Full Splitt Results". European Broadcasting Union. eurovision.tv. May 2014. Archived from the original on 11 November 2014. Retrieved 28 January 2015. ^ a b "Executive Supervisor - Eurovision Song Contest". eurovision.tv. Retrieved 19 April 2019. ^ a b Fenn, Daniel; Suleman, Omer; Efstathiou, Janet; Johnson, Neil F. (2006). "How does Europe Make Its Mind Up? Connections, cliques, and compatibility between countries in the Eurovision Song Contest". Physica A: Statistical Mechanics and its Applications. 360 (2): 576–598. arXiv:physics/0505071. Bibcode:2006PhyA..360..576F. doi:10.1016/j.physa.2005.06.051. ^ "Eurovision 2004 – Voting Briefing". European Broadcasting Union. 12 May 2004. Archived from the original on 7 May 2005. Retrieved 7 May 2005. ^ a b "Results from the draw". European Broadcasting Union. 21 March 2006. Archived from the original on 27 May 2006. Retrieved 27 May 2006. ^ "Eurovision 2011: Voting order revealed!". esctoday.com. 11 May 2011. ^ "Eurovision Song Contest 1956". Eurovision.tv. ^ "A to Z of Eurovision". BBC Online. Archived from the original on 27 April 2006. Retrieved 9 August 2006. ^ "Eurovision Song Contest 1969". European Broadcasting Union. Retrieved 23 July 2009. ^ "Eurovision Song Contest 1970". European Broadcasting Union. Retrieved 23 July 2009. ^ Bakker, Sietse (21 December 2009). "The end of a decade: Stockholm 2000". European Broadcasting Union. Retrieved 21 December 2009. ^ Escartín, Javier (15 May 2009). "Soraya, al borde de la descalificación en Eurovisión" (in Spanish). ABC. Retrieved 17 May 2009. ^ "Albania to broadcast tonights semi-final deferred". European Broadcasting Union. 22 May 2012. Retrieved 22 May 2012. ^ a b c "Two @Eurovision Contests are missing". European Broadcasting Union. 10 May 2015. Retrieved 15 May 2016. ^ Siim, Jarmo (8 October 2013). "EBU starts Eurovision archive project". eurovision.tv. EBU. Retrieved 8 October 2011. ^ N., Danny (4 June 2013). "General: Archive to be opened in time for 60th Anniversary". escxtra.com. escXtra. Archived from the original on 11 June 2013. Retrieved 4 June 2013. ^ "Eurovision Song Contest 1978". European Broadcasting Union. Retrieved 18 July 2009. ^ "Lebanon withdraws from Eurovision". BBC News Online. 18 March 2005. Retrieved 15 July 2006. ^ References are found in "We Don't Wanna Put In"
^ "Reglement du Grand Prix Eurovision 1956 De La Chanson Européenne" (PDF). European Broadcasting Union. Retrieved 19 July 2009. ^ "Eurovision Song Contest 1957". European Broadcasting Union. Retrieved 19 July 2009. ^ "Extracts from the 2012 Eurovision Song Contest rules" (PDF). European Broadcasting Union. Retrieved 20 February 2012. ^ "Eurovision Song Contest 1993". European Broadcasting Union. Retrieved 25 June 2009. ^ "Eurovision Song Contest 1993". European Broadcasting Union. Retrieved 22 July 2009. ^ "Eurovision Song Contest 1994". European Broadcasting Union. Retrieved 22 July 2009. ^ "Eurovision Song Contest 1995". European Broadcasting Union. Retrieved 22 July 2009. ^ a b "Eurovision Song Contest 1996". European Broadcasting Union. Retrieved 18 July 2009. ^ Bakker, Sietse (31 December 2010). "43 nations on 2011 participants list". Eurovision.tv. Retrieved 31 December 2010. ^ Jiandani, Sanjay (14 December 2012). "Turkey will not go to Eurovision in Malmö". ESCToday. Retrieved 14 December 2012. ^ Jiandani, Sanjay (3 November 2015). "Turkey: TRT confirms non participation in Eurovision 2016". ESCToday. Retrieved 15 May 2016. ^ "Eurovision Song Contest 1997". European Broadcasting Union. Retrieved 26 June 2009. ^ "Eurovision Song Contest 2001". European Broadcasting Union. Retrieved 26 June 2009. ^ "Eurovision Song Contest 2004 Semi-final". European Broadcasting Union. Retrieved 22 July 2009. ^ "Eurovision Song Contest 2005 Semi-final". European Broadcasting Union. Archived from the original on 18 May 2009. Retrieved 22 July 2009. ^ "Eurovision Song Contest – Two Semi-finals in 2008" (PDF). European Broadcasting Union. 1 October 2007. Retrieved 18 July 2009. ^ "Bubble rapt". The Sydney Morning Herald. 17 May 2004. ^ "Eurovision Song Contest – Dusseldorf 2011 | News – 'Luxembourg never to return to the contest'". Esctoday.com. 5 September 2008. Retrieved 22 May 2011. ^ "News – Serbia wins Eurovision Song Contest". B92. Archived from the original on 22 November 2007. Retrieved 15 May 2011. ^ Raykoff, Ivan; Tobin, Robert Deam (2007). A Song for Europe. google.rs. ISBN 9780754658795. ^ a b "History of Eurovision song contest". Eurovision.tv. 20 October 2014. Retrieved 20 October 2014. ^ "An Alternate Universe: Eurovision 2017 Under the Old Voting System". ESCXTRA. 14 May 2017. Retrieved 15 May 2017. ^ "Opening of Sweden's ABBA museum is delayed". The San Francisco Chronicle. 12 September 2008. ^ Stanley, Bob (1 July 2015). "Bucks Fizz: more than just a Kwik Save Abba". the Guardian. Retrieved 2 May 2018. ^ Gray, Sadie (19 October 2008). "Lloyd Webber agrees to try to write a winner for Eurovision". The Independent. London. Archived from the original on 10 October 2017. Retrieved 2 May 2010. ^ "Netta Barzilai from Israel wins Eurovision Song Contest 2018". 12 May 2018. ^ "Abba win 'Eurovision 50th' vote". BBC News Online. 23 October 2005. Retrieved 20 July 2006. ^ Borg, Luje (9 December 2013). "EBU: A pan-European survey". esctoday.com. ESCToday. Retrieved 9 December 2013. ^ "60th Anniversay: BBC Confirmed As Show Producers". eurovoix.com. Eurovoix. 29 January 2015. Retrieved 29 January 2015. ^ "Eurovision 2015: BBC to produce 60th anniversary special". officialcharts.com. Official Charts Company. 29 January 2015. Retrieved 29 January 2015. ^ Roxburgh, Gordon (3 February 2015). "Official: London to host Eurovision's 60th Anniversary Event". eurovision.tv. European Broadcasting Union. Retrieved 3 February 2015. ^ Freeman, Guy (6 February 2015). "Eurovision's Greatest Hits – full line-up revealed!" (6 February 2015). bbc.co.uk. BBC. Retrieved 6 February 2015. ^ Jiandani, Sanjay (5 February 2015). "United Kingdom: 4 more Eurovision acts join the party!". esctoday.com. ESCToday. Retrieved 5 February 2015. ^ "Politics 'not Eurovision factor'". BBC News Online. 9 May 2007. Retrieved 25 May 2008. ^ "Malta slates Eurovision's voting". BBC News Online. 14 May 2007. Retrieved 25 May 2008. ^ "BBC News – Russia booed at Eurovision semi-final". BBC. 7 May 2014. Retrieved 13 May 2014. ^ Wyatt, Daisy (24 May 2015). "Eurovision 2015: Russia booed despite song contest's best efforts to put 'music over politics'". The Independent. Retrieved 29 May 2015. ^ "Eurovision 2014: the booing of Russia was a disgrace". Spectator Blogs. 11 May 2014. ^ Majendie, Paul (11 August 2007). "Edinburgh Fringe show celebrates Eurovision kitsch". Reuters. Retrieved 18 July 2009. ^ "Eurovision's Diamond Day". Archived from the original on 3 September 2015. ^ Paul Allatson, "'Antes cursi que sencilla’: Eurovision Song Contests and the Kitsch Drive to Euro-Unity," in the Special issue on Creolisation: Towards a Non-Eurocentric Europe, in Culture, Theory and Critique, vol. 48, no. 1 (Spring 2007): 87–98. ^ "Eurovision votes 'farce' attack". BBC News Online. 16 May 2004. Retrieved 15 July 2006. ^ Derek Gatherer. "Comparison of Eurovision Song Contest Simulation with Actual Results Reveals Shifting Patterns of Collusive Voting Alliances. ", Journal of Artificial Societies and Social Simulation vol. 9, no. 2. 31 March 2006. Retrieved 14 May 2011. ^ "Ginsburgh, Victor and Abdul Noury. 2006. The Eurovision Song Contest Is Voting Political or Cultural?" (PDF). Retrieved 19 April 2019. ^ Spierdjik, Laura; Vellekoop, Michel (18 May 2006). "Geography, Culture, and Religion: Explaining the Bias in Eurovision Song Contest Voting" (PDF). rug.nl. Retrieved 3 June 2015. ^ a b Mantzaris, Alexander V., Rein, Samuel R. and Hopkins, Alexander D. "Examining Collusion and Voting Biases Between Countries During the Eurovision Song Contest Since 1957. ", Journal of Artificial Societies and Social Simulation vol. 21, no. 1. 31 January 2018. Retrieved 16 May 2017. ^ Economist, DailyChart (11 May 2018). "Partisanship at Eurovision is becoming more blatant". Economist. Retrieved 11 May 2018. ^ Economist, WarableGames (12 May 2018). "Neighbourly voting in the Eurovision Song Contest". Economist. Retrieved 12 May 2018. ^ a b Mantzaris, Alexander V.; Rein, Samuel R.; Hopkins, Alexander D. (2018). "Preference and neglect amongst countries in the Eurovision Song Contest". Journal of Computational Social Science. 1 (2): 377–390. doi:10.1007/s42001-018-0020-2. ^ "Eurovision Song Contest 2008". Eurovision Song Contest. 24 May 2008. ^ "erry Wogan 'very doubtful' about presenting Eurovision again". 28 November 2015. ^ Viniker, Barry (8 December 2008). "EBU confirms 50/50 vote for Eurovision Song Contest". ESCToday. Archived from the original on 11 December 2008. Retrieved 8 December 2008. ^ Bakker, Sietse (31 December 2009). "Exclusive: 39 countries to be represented in Oslo". EBU. Retrieved 31 December 2009. ^ a b "Heads of Delegations meet in Vienna". eurovision.tv. European Broadcasting Union. Retrieved 16 March 2015. ^ "Antipov, E. A., & Pokryshevskaya, E. B. (2017). Order effects in the results of song contests: Evidence from the Eurovision and the New Wave. Judgment and Decision Making, 12(4), 415-420". ^ Siim, Jarmo (7 November 2012). "Running order Malmö 2013 to be determined by producers". European Broadcasting Union. Retrieved 9 November 2012. ^ Repo, Juha (8 November 2012). "Mixed feelings about Eurovision rule change". ESCToday.com. Retrieved 22 November 2012. ^ Jiandani, Sanjay (19 November 2012). "Ireland reacts to running order rule". ESCToday.com. Retrieved 22 November 2012. ^ Sanjay, Jiandani (16 November 2012). "San Marino reacts to running order rule". ESCToday.com. Retrieved 22 November 2012. ^ Jiandani, Sanjay (14 November 2012). "Moldova reacts to running order rule". ESCToday.com. Retrieved 22 November 2012. ^ Gavster. "Producers To Decide Eurovision Running Order". esctips.com. ^ "eurovision 2013 running order rule change controversy". Eurovisiontimes. 9 November 2012. Retrieved 23 May 2015. ^ Granger, Anthony (21 September 2013). "Turkvision a snub at Eurovision?". Eurovoix.com. Retrieved 21 September 2013. Gambaccini, Paul et al. The Complete Eurovision Song Contest Companion. London: Pavilion, 1998 ISBN 1-86205-167-4, 160p. O'Connor, John Kennedy. The Eurovision Song Contest: The Official History. London: Carlton, 2007 ISBN 978-1844429943, 208p. Raykoff, Ivan and Robert D. Tobin (eds. ), A Song for Europe: Popular Music and Politics in the Eurovision Song Contest (Burlington, VT: Ashgate, 2007). Yair, G (1995). "'Unite Unite Europe' The political and cultural structures of Europe as reflected in the Eurovision Song Contest". Social Networks. 17 (2): 147–161. doi:10.1016/0378-8733(95)00253-k.
Yair; Maman (1996). "The Persistent Structure of Hegemony in the Eurovision Song Contest". Acta Sociologica. 39 (3): 309–325. doi:10.1177/000169939603900303. Wikimedia Commons has media related to Eurovision.